Cover of the season 4 VCD. 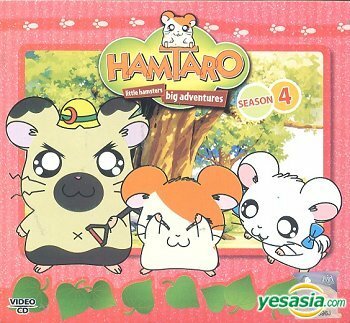 While the majority of the 2000-2006 anime series Hamtaro has surfaced (in both its English and original Japanese dubs), one episode called "The Warm Scarf-capade" remained a mystery for many years, as little to no information was known about it, and it was never included on any English Hamtaro home video releases (nor was it ever broadcast in any English speaking countries). 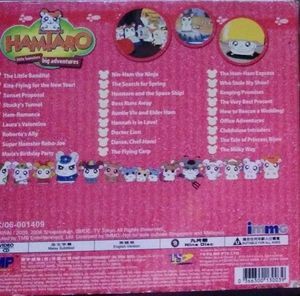 The episode did, however, show up on the 2007 Hamtaro Season 4 Malaysian VCD release, though said VCD is now out-of-print and very hard to find. While the VCD is cited as having English audio, it is unknown if the listed episodes were ever actually dubbed in English, and as such, it may have simply been included with its original Japanese audio. This episode is confirmed to not exist. Proof of this is that the list on Yes Asia skips the episode "Laura's Valentine"; but an image showing the back of the season 4 VCD shows "Laura's Valentine" and does not show this one. More proof comes from the official episode list,  compiled by Cartoon Network and by devoted fans of the series, respectively. While the Ocean dub of Hamtaro, which aired in the United States, stopped at 105 episodes, all episodes of the English dub are accounted for, leaving out the possibility for any "missing episodes" in the first four seasons. The "episode" is most likely a misunderstood skip of the episode "Laura's Valentine", as that episode is accounted for in all episode lists, except for the Yes Asia list, which also includes "The Little Bandits", a Season 3 episode in the Season 4 listing. It also could have been simply a printing error of the Malaysian Season 4 VCD. Back of the aforementioned VCD. ↑ YesAsia.com page on the out-of-print VCD. Retrieved 01 Jan '14.